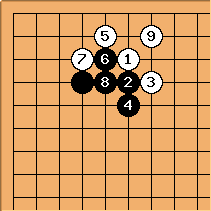 The diagonal move of is much like the jump at , and several variations actually are the same except for the order of moves. This is one of them, so I refer to the jump variation for the continuation. 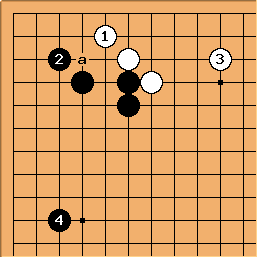 White can also just connect with , after which is correct shape. 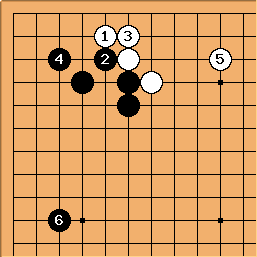 As is quite common in the tsuke nobi joseki, this variant ends with White extending on the top and Black on the left side. 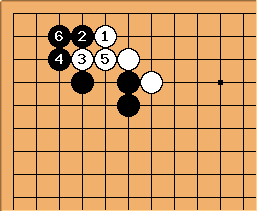 If Black blocks at here, White's stone at in the corner has too much aji. Blocking at directly is a possibility. We see a reversion to a position in the jump variation. on the 3-3 point is the third possible answer. 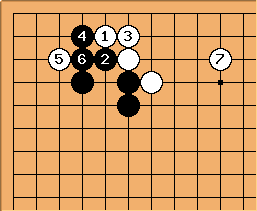 White can again convert to the joseki of last diagram by playing at a, or she can leave the position open by simply extending to .